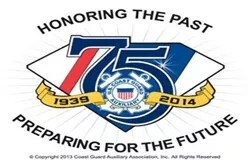 I decided to continue to serve in the Coast Guard Auxiliary as a way to give back to my country, and help support active duty as well as Veterans. The Auxiliary has opened door and opportunities for me to serve alongside the regular active and reserve duty (the gold side counterparts to an auxiliary member). Many of the local stations are limited on their manpower, and the auxiliary fills the void. My skills and prior service as a Marine, can be utilized to help our men and women currently serving. Everything happens at the flotilla level, those are the workers, the troops in the trenches. The flotilla that I am in serves Sector Detroit, and Station Belle Isle. We hold our meetings at the Coast Guard Station, and work closely with them in various missions. Giving back to those that serve, the country, and the community. I was looking to expand on my information technology training, and my path was geared to that end. After Boot Camp I attended my MOS school (Computer Science School) at MCB Quantico, VA. I then was sent by the Marine Corps to the various RASC’s, and then ending (keeping true to a Marines basic function) at a Deployable computer based unit (5th DFASC). 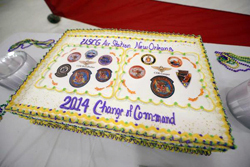 While at the 5th DFASC, we accomplished many “first’s” in Marine Corps history. This unit was a small 30 member T/O billeted unit, but true to the unit’s motto, we were “Good to Go”. Some amazing advances in the technology and computing world were taking place. 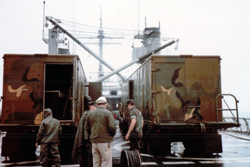 The 5th DFASC was the first ADPE mobile center, taking the computing power of a RASC out into the field to support a MAGTF. We were the first to load onto a ship, USS Fairfax County (LST-1193), first to conduct ship-board data processing, first to deploy in a beach-head landing, first to deploy onto aircraft. There were many first’s that this unit took on and accomplished. In the Auxiliary, I have had the chance to expand on my Marine Corps Training. Taken training and become a Operational Auxiliarist, Vessel Examiner, Program Visitor, and Information Systems. The Auxiliary allows me to support the US Coast Guard in non-traditional roles as well. 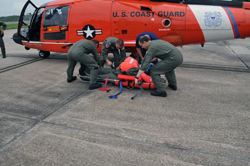 The Coast Guard maintains a skills bank of members with certian skill sets. They can then draw upon these skills on an as needed basis to accomplish tasks which would otherwise overburden active duty manpower. Augmenting the station crew is another way to give your time and talents. Watchstanding or Radio Watchstanding frees up a crew member to accomplish other duties, making full use of their resources. In the Auxiliary, we have participated in many Maritime Observation Missions, Search and Rescue, Aids to Navigation, and Air Support. 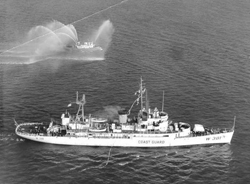 Auxiliary boats and aircraft donate hundreds of hours that might not be available if only active duty did those tasks. Thousands of buoys need to have their positions verified to confirm that are on station and protecting the navigable waters. One of the largest missions of the Auxiliary is Recreational Boating Safety. The Auxiliary promotes safety on the docks and water, gives public education on water safety, boating skills, and rules of the road. Free vessel checks are also performed to advise the boat owner of all the federal and state requirements keeping the boat owner informed and safe. One of the best places I was stationed that gave me the best memories was the 5th Deployable FASC, Marine Corps Base Camp Lejeune, NC. It was there that I was cross-trained on many different fields / MOS’s within the 40xx group, and other duties as well. We trained in garrison, and deployed to the field. We participated on various exercises (Solid Shield and CAX were favorites). The unit consisted of about 28-30 Marines total, so it was a very close, tight group, from our Major down to the last Private. There were many experiences that I had which I don’t believe would have happened if I was at a larger land based unit, that wasn’t deployable. (See news article in my profile documents). We broke ground for many Marines to follow us, as at that time our unit was new, and testing the theory. We accomplished many “firsts” in Marine Corps data processing history. First ship-board unit, first ship-board operations, first beach landing, first air-transport, among others, all for a mainframe computing environment. We even got kudos from BGEN Wineglass on being Marines in the field. CWO4 Williams can share that and other stories. We lived up to our new units motto, as we really were “Good To Go”. On the Coast Guard side, Sector Detroit is the place to be. With missions at the Detroit River Days, to the Ford Fireworks, to Ice Patrol missions, serving here at home with the local Coast Guard just strengthens our resolve to be Semper Paratus (Always Ready). The many friends that I made while attached to the various units I served in. Additionally, many of them are here on TWS, and we have re-connected and re-visited our past memories, true to the mission of this site. The stories from all them members of TWS help create as well as document the history and traditions of which I played a small role in. One of the most heart-wrenching experiences was the recent multi-burial of veterans. 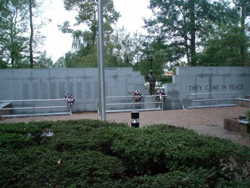 These veterans were unclaimed remains of those that passed without any next of kin or the means to provide a funeral. 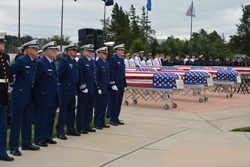 On September 11, 2014, thirteen veterans, located by the Missing In America Project (MIAP) made the long journey to the Great Lakes National Cemetery in Holly, MI. Hearse after hearse pulled into the cemetery until all 13 arrived. Pallbearers made up of many volunteers from active duty Marines, Army, Air Force, and Navy. Members of the Coast Guard Auxiliary also volunteered as did members of VFWs and American Legions. 78 pallbearers carried these thirteen men to their final resting place. One family member was there to receive her brother’s flag. The other twelve were presented to Gold Star Mothers who stood in place for the family these men did not have. Teamwork is what these two awards recognize. The Navy Unit Commendation & Coast Guard Commendation. These awards show not only that we did a good job, but shows the teamwork of the entire unit to earn that distinction. While the other awards also hold great memories, these two signify the brotherhood, or as history has shown many times; “this band of brothers”, the cohesiveness of the Marine Unit. I would have to say that the one Marine that made the biggest impact on me was my Senior Drill Instructor, Sgt Slusser. He instilled in us recruits not only the training that we needed in those long weeks of Boot Camp, but the drive to be the best at everything we do. For that title ‘US Marine’ is a very prestigious honor to have, and it proves that we are the best! The other individuals that stand out the most are the three officers of the small but close knit unit, 5th DFASC. These three were great leaders, and we learned a great deal from them, and I am proud to have served with all three (Maj Marsh, CWO’s Williams and Trimble). This incident stems from my time at the 5th Deployable FASC. Most data-processing Marines, once they have completed Boot Camp and gone on to their MOS in data-processing, leave the grunt work behind. They are used to working in a building, eating at the chow hall, and shopping at the base exchange. 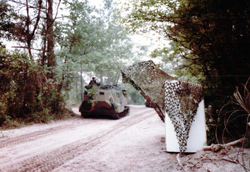 The 5th DFASC brought back the word deployable. This was our first “deployment” and our chance to experience field life. But alas, in the field there is no head, what to do. Well, the sharp thinking minds on the data-processing Marines, took the admin’s jeep (it had a little trailer) and returned later with a port-a-john, which of course they covered and concealed with camo-netting. I followed the path I started in high school; the Information technology realm. I am currently supporting the IT infrastructure (soon to be a national realm) of a transportation business, including Main site, VPN remote sites, and hundreds of mobile data (in vehicle) terminals. In the Auxiliary I have continues my Information Systems path, becoming the Division Staff Officer-Information Systems. This position tasks me with correctly recording submitted hours and supporting the other staff officers with Information Systems support. Data Processing in a nutshell, pulling training reports and others as needed. AMVETS, American Legion, American Cold War Vet Assoc, Marine Corps Vet Assoc, Marine Corps League, NCO Association, NAUS, VFW. I also serve in the USCG Auxiliary. Being an auxiliarist has allowed me to re-connect with my military memories, as well as re-establish those connections that I had while serving in the USMC. Back in uniform, and giving of my time and talents to support the US Coast Guard’s mission. Boating Safety is the primary mission of the Auxiliary, and we augment the USCG in other areas. As I expand my career in the Auxiliary in areas of Vessel Examinations, Program Visitors, and Auxiliary Operations (including USCG Watch Standing) with Boat and Air Stations, I will continue to focus on giving back. Military life has given me a sense of discipline and responsibility. Bearing, as they teach you in boot camp, is how you carry yourself. The leadership traits you learn can all be applied throughout your life, and will serve you well into your future years, whatever the situation is. The skill set is useful in maintaining good work ethics. Leadership is key in almost all businesses, and those experiences in the USMC and USCG have developed and honed those skills. Keep the faith. Be true to yourself and your service branch, do your best at all times. As a Marine I still uphold the Marine motto ‘Semper Fi’. Know that we all veterans and civilians alike, support the things that you do that ensure the preservation of our freedoms. Thank You for your service !! TWS has let me re-connect with many of the Marines (and other branch service members). It is all about keeping those connections, and developing new ones along the way. The camaraderie that one develops while serving in any of the armed forces runs deep in the soul of that person. TWS, regardless of the branch, allows that brotherhood that we had in time of service to rise up and flourish again. I have been able to make remembrance profiles for some of my family members (my father and grandfather) who served in WWI and WWII. Having a place that my family can share information and service history of our relatives is a great way to honor their contributions to the freedoms that I enjoy. Additionally, I have the honor of adopting a fallen member(s) profile from the current era, and can ensure that his sacrifice to this nation is not forgotten. 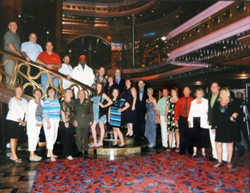 From the stories and knowledge that the veterans have for the newer service personnel, to the lively banter in the forums, TWS allows the history to be both cherished and passed along.